This is Suquay. Let me tell you her story. 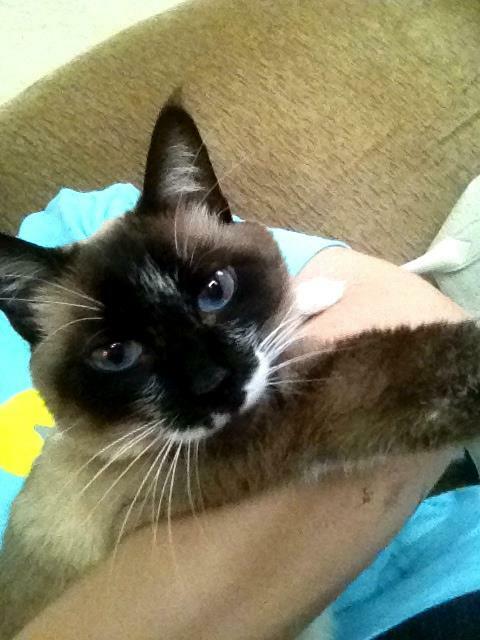 Nine years ago, when I was in college, I randomly woke up one morning with the burning desire to own a Siamese kitten. So I picked up the phone book (yes, kids, that’s what we did pre-iPhones), looked up veterinarians, and called the first vet’s office that was listed. She was beautiful, and she was completely terrified. She yelled at me the whole way home. When I got her home, I put her in the bathroom with a litter box and some food and water. Every time I would walk into the bathroom to check on her, she’d crouch down in her litter box and growl at me. I still petted her and talked to her as if nothing was wrong. By about the second or third day, her pattern changed slightly. She’d still crouch and growl at me from her litter box, but when I reached to pet her, she’d immediately begin purring loudly. Slowly but surely, she became more trusting. She also became very dependent and possessive of me. When John and I started dating, she most certainly did not approve. She would sit in my lap and glare at him coldly, refusing to allow him to pet her. Life has changed a lot. The cat that was nearly psychotic with trust issues now only appears shy and quiet to any guests that may come through. My marriage and our two kids have eaten up so much of my time that now, Suquay will take affection from nearly anyone. Well, anyone but John or my kids, that is. Unfortunately, John is very allergic to her, as is Cameron (my son.) And with this upcoming move, I am considering the possibility of finding a new home for Suquay. I know she wouldn’t do well on the 6 hour trip there. She becomes very anxious during car rides even with sedatives, and I am worried that she might work herself into a heart attack on such a long trip. Please hear my heart here… I feel like I’m giving a child away. I love this cat more than I can say. She’s actually cuddled up in my lap as I type this. She sleeps in bed with me. (Not good for John’s asthma or allergies, I know.) But I would be devastated if she died in transit to Houston, and I am sincerely worried about John and Cam… especially Cam with all of his crazy allergies. So, would you be a good fit for my Suquay? Really, the best possible scenario would be if someone who doesn’t already have pets or small children would adopt her … Someone who has the time to give towards establishing a rapport with her. In all honesty, it might take a couple of weeks before she warms to anyone. But once she’s attached to you, she really is the best cat I’ve ever had. She’s affectionate, quiet, clean, and she uses the litter box. She doesn’t beg for human food or get on tables or counters. She stays inside because she’s afraid of outside. She’s been spayed and declawed. Because she’s been declawed, she MUST be an inside cat. Someone once said to me that I was such a gift to Suquay… to nurture her and love her through her emotional healing. But truly, she was God’s gift to me. Loving her and watching her heal and trust again gave me hope that someday, maybe I could also heal. I really do think that random thought of, ‘I want a Siamese kitten,’ was God’s divine providence. We needed each other. Anyway, if you’re interested in Suquay and would like to meet her to see if you’d be a good fit for each other, please let me know. I have a “pet taxi,” a litter box, and food, so you wouldn’t be out anything to get started with her. Let me know if you have any questions. 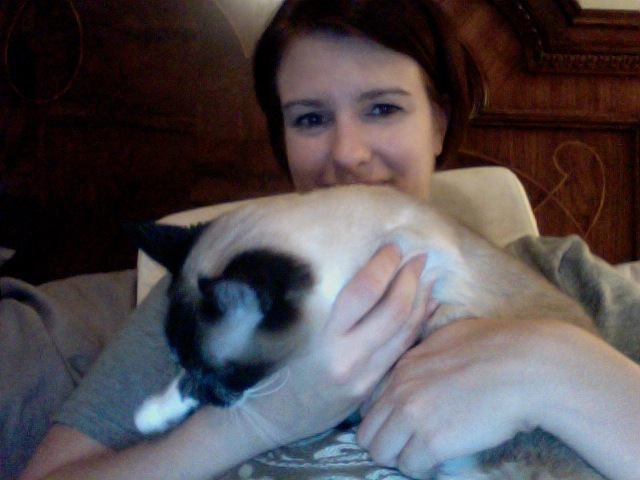 Suquay crashing my lap as I write this very post.